Body contact is kept to a minimum with this pack, thanks to its trampoline-style Freelow back system. The body is uncomplicated, with far fewer straps, zips and buckles than other sacks have. But you do get a generous-sized external pocket on the xed lid, with a smaller one on the inside and two zipped pockets on the hipbelt. There are also three stretch external pockets – one on each side and a large one on the front. The main compartment has a lower compartment with external zipped access, though removing the divider makes one big compartment. This all works well, and the Freelow 40 is more comfortable than many packs, but some of the other sacks here offer more comfort and have a wider range of back size options, including women’s specific models. Price, air flow back system, fixed lid that won’t flap about. Less back length adjustment options, you may prefer a pack with zipped rather than mesh side pockets, higher-priced sacks are even more comfy. It ts you and you want a well-priced, simpler pack with a fixed lid and good air flow around the back. Vango’s F10 Hut 45 is very well-priced for the features on offer, which include a trampoline-style back system with masses of airflow and great cushioning, making this the ideal choice if you want a little more comfort than the lower-priced packs can offer. The back length can be adjusted by raising or lowering the shoulder harness. The opening to the main compartment has a zipped closure, which we felt was a drawback, as if the zip ever fails then the sack is useless. The zipped closure also prevents you from overstuffing it. However, the zip does allow a better access to the main compartment than a buckle lid. The other drawback was that the hipbelt’s padded fins were a little short, so the hipbelt was not as comfortable as others. I’ve used the bigger 52+8 version of this pack for a multi-day Munro raid into remote Fisherfield, so I know it carries a big load well. This 42+8 version is more suited to hostel-to-hostel walks than camping, and I could feel the weight in my back under a heavy load more than with some other designs. The adjustable padded back system did allow a perfect fit for my 6ft frame though, which some other packs could not achieve, however there is less airflow around my back, so this was a hotter pack to wear. What really appeals is the simple, clutter-free design compared to some. The main niggle was that the big front zipped pocket does not stretch, so does not easily hold much if the main compartment is over full. The Airzone is very competitively priced for the features on offer, but is this enough to impress on a long day in the Lakes? The Airzone is designed to keep body contact with the back system to a minimum by having a gap between the tensioned trampoline mesh back and the main pack itself. I found this worked really well, as my back and shirt remained dry. There are plenty of storage options to place gear outside the main pack with five external zipped pockets – large ones on the top and on each side, and two very small ones on each side of the hipbelt. You also get two generously-sized stretched water bottle pockets again on each side, and a bungee spider plate on the rear of the pack. The main pack’s contents can either be accessed conventionally via the top extendable floating lid, or by a zipped front opening. The main compartment can also be divided by a zip-out panel into a smaller, lower compartment with separate external zipped access and top compartment. It is the combination of the floated lid and zipped side pockets that allow the capacity to be extended from a basic 40ltr to a bigger 50ltr. So there’s lots of things to like. Although there are two back sizes available, neither size has additional back length adjustment, so the pack either fits and is comfortable, or it doesn’t and isn’t. It was not quite as comfy as the highest-priced pack either. Then there is the floating lid design to think about. I found that it tended to bounce around and required adjustment a few times to ensure it sat neatly on top of the pack. Personally, I’d prefer a lid that was attached to the main body, so that all this adjustment wasn’t needed. The zipped divider and zipped front opening make the bag overcomplicated for me too, as these features aren’t something I’d generally use on this size of pack. 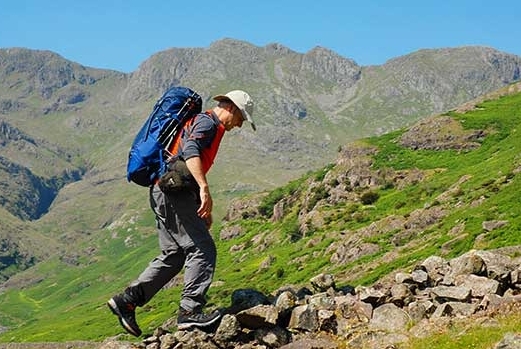 The Lowepro Airzone is well-priced and comfortable to carry on a long, hot day in the fells, and has great features in general but there are less back length fit options than some packs allow. 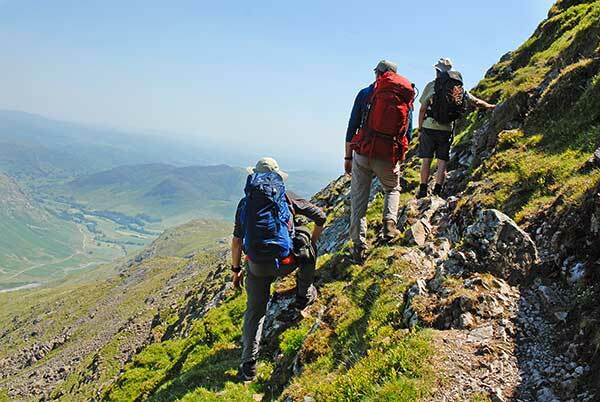 Does the new Aircomfort Sensic back system and Vari Flex System hipbelt make this the go-to rucksack for hillwalkers? This is the 2018 version of the popular Futura Pro, now sporting a new back system called Aircomfort Sensic, which holds the pack away from the wearer’s body with a trampoline mesh for more airflow. Importantly the back system also has a Vari Flex System hipbelt, which is able to easily move with the wearer’s body when scrambling. Also the hipbelt fins are well padded and very supportive, which allows them to comfortably support heavier loads better than the lower-priced packs. The back system also gently twists with the body, so again this allows great weight transfer and comfort. The main body has a fixed lid, so there is no fear of water creeping in behind the lid and the body – this was a feature that all three of us testers loved. There is a bottom compartment with a removable divider and also bellows side pockets that easily take water bottles. Compression straps, stretch mesh side pockets and a good front stuff pocket complete a superb design. There is no back length adjustment available, other than choosing the bigger 44ltr version. Also there is no women’s option in the 40-50 litre size range, although you can get a Futura Pro 38 SL 38 pack with the same features if you don’t need so much space. You will spot online the previous version –the Futura Pro 40 SL – with the older Aircomfort Pro back system rather than the new Aircomfort Sensic design of the 2018 model. At 1690g the Futura Pro 40 is heavier than some here. This is due in part to much more robust materials, and also that the hipbelt is so much more supportive than lighter packs. The main drawback is the price, which just seems a little steep. More comfort and better support for heavier loads than lower-priced packs, with a great fixed lid and great airflow across the back. Our main niggles: price, no women’s option, and it is a bit heavy. Its AntiGravity back system makes big promises, but does it translate for weightless backpacking out on the hill? I never realised how long I had suffered with ill-fitting packs until I put on the Atmos. It felt like relaxing into a favourite armchair, thanks to its trampoline mesh-style design holding the pack away from the body and making it extremely comfortable. In addition, as it comes in two back lengths with additional back length adjustment I was able to adjust it to fit my 6ft 4in frame and long back properly, unlike shorter, single-sized packs. The AntiGravity back system makes heavy loads feel almost weightless and I never tired of carrying it, which seems strange when this is the heaviest pack on test. It will carry 50 litres of kit, not relying on expansion or external pockets to make up the capacity, and I loved the huge front mesh pocket, which was big enough to stuff in a jacket and water bottle for easy access. 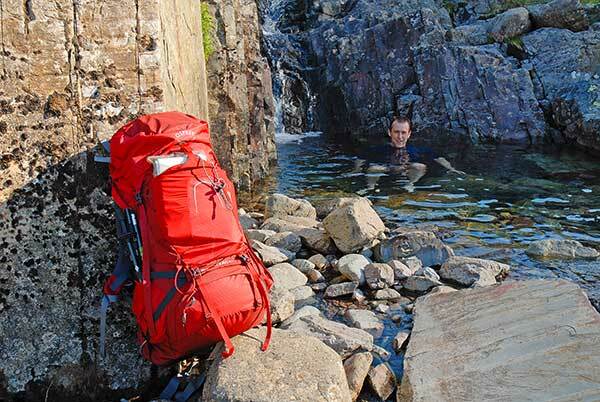 This pack passes with full marks for comfort, fit and ventilation. Superb. My first impressions were that there were just too many straps everywhere and some are so long that they dangle annoyingly. However, once I got to know it, I did overcome this impression and grew to love it. The one niggle that remained was the lid. I felt that a traditional large fixed lid on the pack would have been better for British hillwalking, rather than the overcomplicated combination of a large floating removable lid, plus an additional smaller Flap Jacket lid that is there to cover the main compartment if you remove the main lid. Also, I had to adjust and tighten the straps on the floating lid throughout walks to keep it fitting perfectly. It was just an unnecessarily messy design. 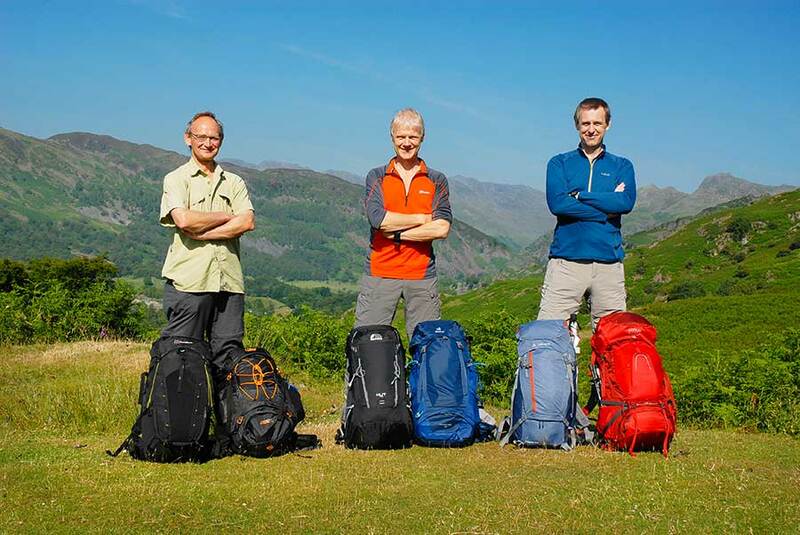 This is the priciest and heaviest pack on test – so you really need to decide if it’s worth £170 to you. We all agreed the Atmos 50 is the perfect pack for multi-day trips, thanks to its comfort, adjustability and capacity, while its awesome airflow across the back means you’ll only sweat when handing over the £170 asking price.